A small star cellular floated about serenely. This was an indication of the smoothness of the prevailing Southerly breeze, since the star will move about quite erratically in most inland breezes. A couple of mid-sized Parafoils were up now as well, with some small items of line laundry dangling. Crouching down beside a brush fence, I found a handy spot on the grassy area to rig the Red Roller - a dowel-and-tyvek kite. On a short line, it was straightforward to walk the kite down to the beach access point and hence onto the sand. A calico shopping bag with a few kilos of sand poured in was sufficient to hold the Roller. Just over 30m (100ft) of line seemed appropriate since the beach was not exactly deserted. The Roller kite stayed pretty much 'nailed to the sky' for over an hour. A brightly decorated Dowel Dopero took a bit of trimming with shifting the bridle knots and re-attaching a sail tether. But finally it was up and away and flying at a good angle. Uncharacteristically, I didn't check the wind speed on the day - but it seemed ideal for most kites, being somewhere round the low end of Moderate. High teens, low twenties in kph perhaps. Good flying, in sunny weather! Despite the light conditions - which eventually deteriorated to very light - a good amount of flying was achieved by a variety of kites. Variety being the operative word! Kites in flight included a small bird, large parafoil, dowel delta, dowel diamond, small soft sled, parasail and a medium 4-cell parafoil. Plus a half-inflated monkey suspended by the large parafoil. The weather was pleasant enough with cool air and plenty of sunshine. The newly-completed MBK Parafoil prototype #3 had it's first flights and proved capable of staying in the air tail-less - but only just. After getting a few in-flight close-ups, I put a small drogue on and let out more line. The light-wind capability of the kite was a surprise. With 3 straight lines in the design forming the upper surface curvature, the kite in flight rounded this off to a nice smooth airfoil shape. It seemed to be lifting well, considering the light air. Today was such a day, when the large parafoil inexplicably sprouted a small drogue - trailing from the exact center-line of the kite. It only took a moment for me to recognize the drogue - and realize that my own smaller parafoil had descended onto the upper surface of the much larger kite! By carefully taking in line, my own parafoil appeared, inflated and lifted off. Something that will probably never happen again. After some time the breeze lightened further and kites started coming down. After packing away the parasail and parafoil, I brought out the Dowel Diamond which proceeded to keep company with the ripstop-sailed Dowel Delta already flying. A small event this month, but certainly enough to educate the passing pedestrians that kite-flying is not just for kids. The wind wasn't sure what it wanted to do, for a while there. Just before we arrived, apparently, the breeze was very light - only to suddenly freshen to 3 times the strength. Pack away the light-wind kites! So instead of pulling out the Dowel Sode as planned, out came the new MBK Parasail. It would appear that this kite will quickly become known as the Jellyfish Kite, going by several people's immediate response to seeing it. Completely unintentional, but the slightly milky painters' drop-sheet plastic does give a great impression of the sea creature. Together of course with all the bridle lines extending away from the sail. While flying the Parasail a couple of other kites went up as more AKFA members arrived. Meanwhile the breeze had started coming from the East for a while and dropped out in strength. Eventually though, the wind came back from the North and stayed at a good sub-moderate strength for much of the afternoon. This was the perfect opportunity to put up quite a long train of MBK Multi-fly Diamonds. Ten this time - a personal best! With seven on the line I measured the pull and it was peaking at only about 3.5kg (8lbs). At least a couple of stunt kites were up now, enjoying smooth winds of adequate strength. A few more single-liners could be seen as well, plus beach-goers were starting to stop and look around at all the action. A local KAP photographer suspended his camera right next to the Diamond train for ages. No doubt some interesting images will be popping up on FB soon!Great weather and great flying until the average breeze strength finally sagged below 9kph. A quick check of the weather station convinced me that bringing a real light-wind kite would not be essential. To be on the safe side however, we did have the 2-Skewer Barn Door in the car. On arrival at the beach near Fort Glanville at mid-afternoon, it turned out that the sea breeze was in. Holding up the wind meter to the smooth southerly, it registered around 18kph while gusting to 23kph. A bit heavy for the Barn Door, but we put it up anyway. Several other kites of all sizes were up already. Including a traction kite and a 2-line stunt kite or two. After a few photos, short videos, plus some conversation with other flyers, the little orange Barn Door had had enough. One of the younger AKFA members had rescued it from the dunes and was attempting to free the 20-pound dacron line from bushes. With my help the kite was packed away before more appropriate craft were brought out from the car - four Multi-Fly Diamonds! The wind speed was smack in the middle of the Diamonds' wind range, so they flew steadily at a 45 degree line angle. Spaced less than 3 meters (10ft) apart, the color-coordinated kites flew as one. Short side-tails fluttering in contrast to the long and steady looped main tails. With an hour or two of flying time remaining, the sun broke out at last. Perfect! Not to mention being handy for doing a little more photography. The final photos were taken by Aren (10), showing how easy the Multi-Fly Diamonds are to carry as a group. Just slip your hand through the diamond holes and grab all the vertical spar tubes at once. A nice outing with thoroughly pleasant Autumn temperatures. Fairly light winds were forecast, particularly around the middle of the day. With the chance of freshening winds as the afternoon wore on. This was pretty much what happened, with an early meter reading of 14kph gusting to 17kph and a later reading showing 19kph gusting to 22kph. Very nice wind speeds for your average kite flyer! As usual, I first spent some time wandering around with the camera, capturing stills and videos of all the action. Kites, large and small, were going up almost from minute to minute. It was looking like a perfect day for single-line kiting. As the breeze came up further, a number of stunt kites joined the fray as well. The sun blazed down from a largely blue sky, ensuring a vibrant colorful spectacle for all the beach-goers - most of whom would not have been expecting the mini kite-festival in progress. Finally, I decided to give my newly-repaired KAP (Kite Aerial Photography) rig a fly. Might as well get some practice in, before the Adelaide International Kite festival later in the month! The 25th to the 28th, to be exact. Up went the bamboo-skewer cage, dangling almost motionless under a 100 pound Dacron line. The lifter was a 2m (7ft) Tyvek and carbon tail-less Diamond. By this time, the kite was in the upper half of it's wind range, but still flying comfortably. Perfect! Photos were taken at 10 second intervals, from about 50 feet off the sand to nearly 300 feet altitude. Due to distance, only the largest kites were visible in the photos. Also, many kites were flying fairly low and hence had either sand, grass or trees as a background. Perhaps we KAPers all had the same idea regarding the up-coming Festival - no less than 3 rigs were in the air at once today! Weather-wise, it could hardly have been better. A smooth southerly was coming off the ocean, making just a slight angle with the roughly north-south orientation of the beach. Not long after arriving, I measured the breeze at about 17kph and gusting to 22kph. A fair amount of puffy cumulus cloud was about but for most of the time the sun shone strongly. Initially, just a large parafoil was up. Shortly followed by the ever-present small Pterodactyl and another parafoil. After wandering around taking copious photos and videos, it was my turn with the 2m (7ft) tall Carbon Diamond. The tail-less kite soared to a high angle on it's 100 pound line, anchored by a calico bag half-filled with sand. Meanwhile, a number of other AKFA members turned up and started getting kites in the air. As far as line-laundry goes, there was a monkey, an Aussie flag and a small octopus. The octopus was probably capable of flying on its own, but made a fine display hanging off the flying line of a large black parafoil. Oh, and there were enormous Geckos as well. Two of them, under different parafoils. Eventually I got around to grabbing a handful of Multi-Fly Diamonds and put them up one by one on a 100 pound dacron line. This time, slightly closer inter-kite spacing was tried. No problems at all, thanks to the smoothness of the breeze! In the end, just about the full range of commonly seen single line kite designs were in the air. Deltas, diamonds, boxes, novelty, parafoils. Something for everyone, as beach-goers walked through and had a look at the aerial display. More like the AKFA mass kite sink-out, unfortunately... On approaching the beach by car, a couple of large kites could be seen, comfortably floating over the grassed area. Minutes later, however, they were both down and the guys were scrambling for lighter-wind kites to try. I had some Multi-Fly Diamonds on board, with another tail configuration all set for a try-out. It was not to be. Not today. Instead, out came the trusty Multi-Dowel Sled. 2.4 meters (8 feet) in height when plugged together, and great in very light air. In no time, it was rigged and several attempts were made to launch. The dowel drums securing the spars were a little loose from many hours of flight time over several years, but what could possibly go wrong on such a light day with little direct sunlight to heat the ground? Finally, the big Sled took to the sky, being climbed out with the help of a gentle puff of air and much walking-back and working the line. Above 100 feet it was just holding it's own, but a list to the left was not helping. So, down it came, for a quick bridle-knot re-adjustment. With some help from another AKFA member, a long-line launch soon had the ponderous blue Sled back up, inching past the light grey backdrop of mid-level cloud. The cloud cover burnt off and the sun blazed down. Strong thermal activity began and soon the Multi-Dowel Sled began to overfly on its 200 pound Dacron line. 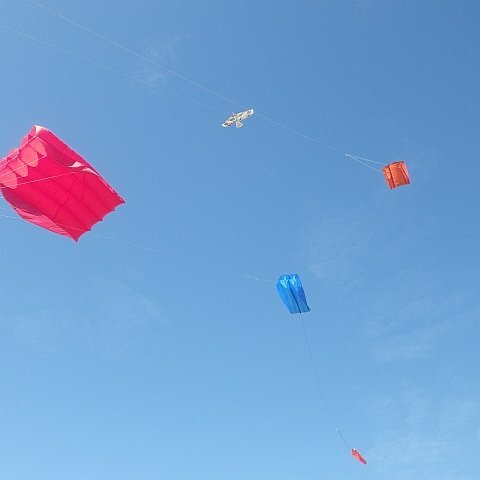 While directly in line with the early-afternoon, the kite flew out of the rising air and in all the free-falling shuffling around of the plastic and dowel, all 3 drums worked loose and the kite folded in half! Amazingly, it continued to fly for a while with the upper half folded back over the lower half. A quick, pull-in of all the line was all that could be done, but on retrieving the kite (thanks Mike) no damage could be seen. At least something flew for while!